“There is, for all of us, a moment when excitement and nerves fuse, when we prepare to journey and do something we have anticipated for a long time. 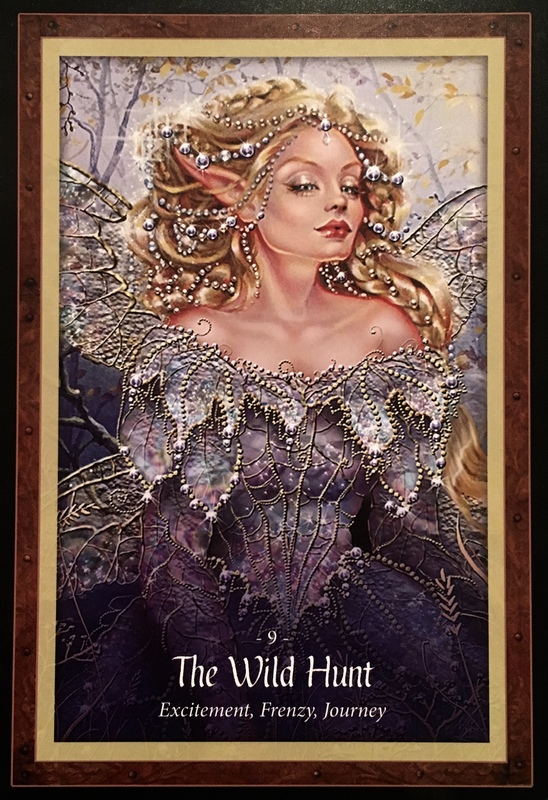 In the faery realm, this sensation is created by the adventure known as The Wild Hunt. This is a gathering which takes place not only within the realm of faery, it is one where the faery king and queen lead faery hounds and faery horses on a hunt throughout the countryside, dipping into and out of the faery lands, surfacing in the human worlds form time to time, cleansing toxic energies, allowing natural forces to begin to flow through the cleared energy paths, awakening the wild world to brightest life once again, and leaving a trail of ecstasy and bliss after the frenzied storm of their ride. All this heavy change lately. The internal work, the releasing, the processing. The transformation. It’s time for some fun. Some wild abandon thrown in there to stir up the energies. Some dancing under the stars, skinny dipping or singing at the top of your lungs. It’s time for surprises and unexpected gifts. It’s time for not so secret admirers and passionate embraces. It is time for a change. There may be a curve ball coming in, but in a good way, if you decide to deem it so. Receptivity, as usual is key! Dust off your Wild One and bring her, or him out to play! Put on your dancing shoes, your favourite outfit, paint your nails bright purple, change up your hair. Flirt a little, shamelessly (and harmlessly!) Get out of your boring old comfort zone and try something new. Don’t stay home today, get out there! And don’t forget to bring your big, beautiful smile. Perfect Timing for an interview today that will lighten my heart and allow some fun! Thank you Dee!